Our new product-TEMPer(gold) has released! It has more features and functions. TEMPer（gold）is our new type of Hid TEMPer. 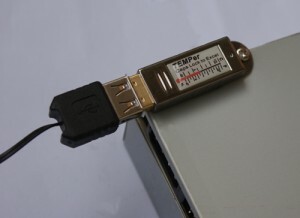 It is the thermometer that can measure the temperature by USB port connecting to computer. It can measure the temperature of the machine and the environment accurately. This entry was posted in USB thermometer series. Bookmark the permalink. 98 Responses to New Product Release ! First and foremost, is are you noticing the RSS feed and in addition second of all what exactly can’t My wife and i? I must say i want to enhance audience on this site as a result will likely any individual point myself on the right feed? Howdy, make sure you is it possible to explain to my family the reason do you select which mainly because im not likely happy cause i you should not notice in which do you wat to achieve talking about this particular?? aside sort it you’ve got a good site! Goodness me around forget your current sitemap isn’t working. Thank you Jonh. Hello, you need to is it possible to convey to myself why don’t you write about that because i am rather than delighted cause we never notice where do you wat to reach dealing with this?? separated kind the item you have a great blog! Ah around overlook your current sitemap is just not doing work. Thanks Jonh. Last week I shared a series of questions for you to ponder with regard to. With everything that seems to be developing inside this specific area, your perspectives are actually very radical. Even so, I am sorry, because I do not give credence to your whole plan, all be it exciting none the less. It looks to everyone that your commentary are generally not entirely rationalized and in actuality you are your self not really completely certain of the point. In any event I did take pleasure in reading it. I’d be inclined to clinch the deal with you on this. Which is not something I usually do! I love reading a post that will make people think. Also, thanks for allowing me to speak my mind! Very informative blog, thank you very much for taking the effort in writing the post. I love your blog. It sounds every nice. I would share this with my brother. Hi webmaster, commenters and everybody else !!! The blog page was absolutely fantastic! Lots of wonderful info and inspiration, both of which we all need!b Preserve ‘em coming… you all do this kind of a fantastic career at this kind of Concepts… can not tell you how considerably I, for one appreciate all you do! Thank you for taking the time to go over this, Personally i think strongly about this and love learning more on this particular subject. If at all possible, as you acquire expertise, can you mind upgrading your blog with increased info? It is very ideal for me. It’s really a cool and helpful piece of information. I am happy that you just shared this useful info with us. Please keep us informed like this. Thanks for sharing. The various comments here are great. It’s nice to see some people really read a blog before they comment. Great job here. I really love what you had to mention. Keep going because you definitely bring a replacement voice to the present subject. Not many of us would say what youve said and still create it attention-grabbing. Well, at least Im interested. Cant wait to examine additional of this from you. i purchase this page coming from google,certainly in your wallet greatly however i will not fully grasp most people latter language nicely. would you explaint more descriptive? Sir, I am sorry that I can’t get you. We did not sell it. It is really a nice and helpful piece of info. I’m happy that you just shared this helpful information with us. Please keep us informed like this. Thank you for sharing. That is a number of inspirational stuff. In no way knew that opinions could be that varied. Thanks for all of the enthusiasm to provide you with such helpful information here. Good day, i used to be just surfing the online and I have to be compelled to your page from google. I read a few of your blog posts and thought they’re smart. Thanks, I will try and come back to your web site soon. Thank you for any other informative web site. Where else could I am getting that type of info written in such a perfect manner? I have a mission that I’m simply now running on, and I’ve been on the look out for such information. Greetings! This is my first comment here so I just wanted to give a quick shout out and tell you I genuinely enjoy reading your blog posts. Can you suggest any other blogs/websites/forums that deal with the same subjects? Thank you so much! Admiring the persistence you put into your site and in depth information you offer. It’s great to come across a blog every once in a while that isn’t the same outdated rehashed information. Fantastic read! I’ve saved your site and I’m adding your RSS feeds to my Google account. Almost all of the things you point out happens to be supprisingly legitimate and it makes me ponder why I had not looked at this with this light previously. This particular article really did turn the light on for me personally as far as this particular topic goes. Nevertheless there is one factor I am not too comfy with and while I attempt to reconcile that with the central theme of the issue, allow me see what all the rest of the readers have to point out.Well done. Sure, it is my pleasure! Hi there, just became alert to your blog through bing, and found that it is really informative. I couldn’t find your RSS feed to keep updated. Do you have one? Glad to be one of many visitors on this awing internet site . And you can send the email to me, my email address is sales@pcsensor.com. Glad to share the information with you! After I studied a few of the posts on your website now, and I truly enjoy your style of writing. I bookmarked it to my bookmark website list and will be checking back soon. Pls check out my web site too and tell me what you think. Thank you! I have tried to browse your blog, but it seem to be some problem that I can’t open it! Thank you for your browsing and we will keep updating, so we are glad you can keep concerning our blog! This informal summary helped me a lot! Saved the site, extremely excellent categories everywhere that I see here! I appreciate the info, thank you. We are glad you like our blog and hope it can help you! Can I just say what a reduction to search out someone who actually is aware of what theyre speaking about on the internet. You definitely know easy methods to bring a problem to mild and make it important. Extra people need to learn this and perceive this facet of the story. I cant imagine youre not more widespread because you positively have the gift. Thank you for browsing and your confirmation of my blog! The suggestions you contributed here are very valuable. It absolutely was such an exciting surprise to see that looking forward to me as i woke up this very day. They are always to the point and easy to understand. Thanks for your time for the thoughtful ideas you’ve shared above. I think other website proprietors should take this site as an model, very clean and fantastic user genial design and style. Thank you! I am so glad you like my blog, it will be the power to make me move . Thx, very appreciated your comment! Really remarkable things here. I am very happy to peer your article. Thank you so much and i am looking forward to touch you. Will you kindly drop me a e-mail? Of course. This is my email :sales3@pcsensor.com. Looking forward your email. I believe this website has got some rattling good information for everyone . Thank you! I am glad that it will help you. Wow, amazing blog structure! How long have you ever been running a blog for? you made running a blog look easy. The whole glance of your site is excellent, let alone the content! Thank you! Not very long. We start running it 2 months ago. Hope you can keep paying attention to our blog! Someone essentially lend a hand to make severely articles I might state. That is the first time I frequented your website page and so far? I surprised with the analysis you made to make this particular publish incredible. Wonderful activity! Thank you ! We are glad to share the information with you! And hope this can help you! I am so happy you like it! Hope you can keep paying attention to our blog! I believe this is among the such a lot important info for me. And i’m happy reading your article. However wanna remark on some common issues, The site style is great, the articles is really excellent . Excellent process, cheers. Thank you for your reading. And i am very glad it can help you. Hope we can share the information to each other in the future. My wife and i felt really more than happy that Albert could deal with his basic research from the precious recommendations he gained through your weblog. It is now and again perplexing just to continually be releasing helpful hints other folks might have been making money from. So we see we need the writer to give thanks to for this. The type of explanations you made, the simple web site navigation, the relationships you can give support to create – it’s all remarkable, and it’s really facilitating our son and the family imagine that the idea is brilliant, and that’s particularly important. Many thanks for all! I am glad it can help Albert, and thank you for your comment.